In 1914, the main concern of the Turkish Navy was maintaining a balance of power with the Greeks with whom relations were very tense. Both countries were attempting to enlarge their navies and Turkish orders included two British dreadnoughts, two scout cruisers and four destroyers, none of which were delivered. In fact the non-delivery of the two completed dreadnoughts did much to bring Turkey into the war on Germanys side in November 1914. By then the only modern additions to the Turkish Navy were the German battlecruiser 'Goeben' and light cruiser 'Breslau', which having escaped from the British Navy in August 1914, were nominally transferred to Turkey although largely retaining their German crews. The entire Turkish fleet then came under the command of German Rear-Admiral Wilhelm Souchon. Although much of the subsequent action against the Russian Fleet in the Black Sea is associated with the 'Goeben' and 'Breslau', the obsolescent Turkish Navy played its part, including the combined German-Turkish bombardment of Russian bases before the declaration of war. Other operations included escorting coal convoys from Zonguldak to the Constantinople area, sweeping Russian mines off Constantinople, escorting troop convoys through the Sea of Marmara to Gallipoli, manning some of the Dardanelles defences, and operating light flotillas on the Euphrates and Tigris Rivers. Residaye and Sultan Osman I completing in Britain. Both taken over by Royal Navy in August 1914 as 'Erin' and 'Agincourt' respectively. Paid for by Turkish public appeals, there was widespread resentment at their requisition. Yavuz Sultan Selim - 'Sultan Selim' or variously 'Yavus', 'Yavouz', or 'Jawus Sultan Selim', modern 'Yavuz' - meaning stern, tough, grim, even amazingly clever. Sultan Selim I (1470-1512) who greatly expanded the Ottoman Empire is often referred to as Yavuz Selim - Selim the Grim. Battlecruiser 'Yavuz' survived until the 1970s to be broken up. Goeben arrived in Turkish waters on 10th August 1914, served under the Turkish flag with her German officers and crew from 16th August, and officially transferred to Turkey in November 1914, although still mainly German manned and controlled. 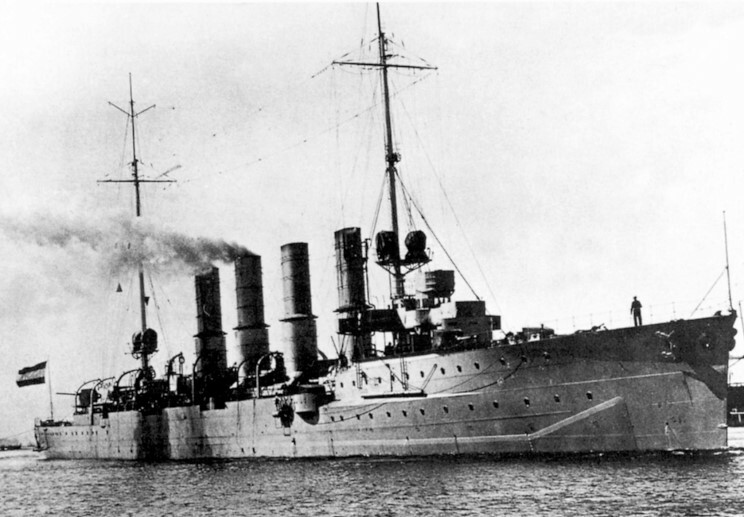 On the 29th October 1914, 'Goeben' and light cruiser 'Breslau' (see below) took part with Turkish forces in bombardments and raids on Russian Black Sea ports and shipping before the formal declaration of war between Turkey and Russia. Goeben, damaged 26th December 1914, Black Sea in Turkish waters, 1 mile off the outer buoy into the Bosphorus - 2 Russian mines. On the 21st December 1914, Russian minelayers laid a large field off the Bosphorus. By then 'Goeben' was escorting three transports to the eastern port of Trebizond. On the night of the 23rd/24th, the Russians attempted, unsuccessfully to block the entrance to Zonguldak to stop the transport of vital coal supplies. 'Breslau', sailing to meet 'Goeben' intercepted and sank two of the four blockships. 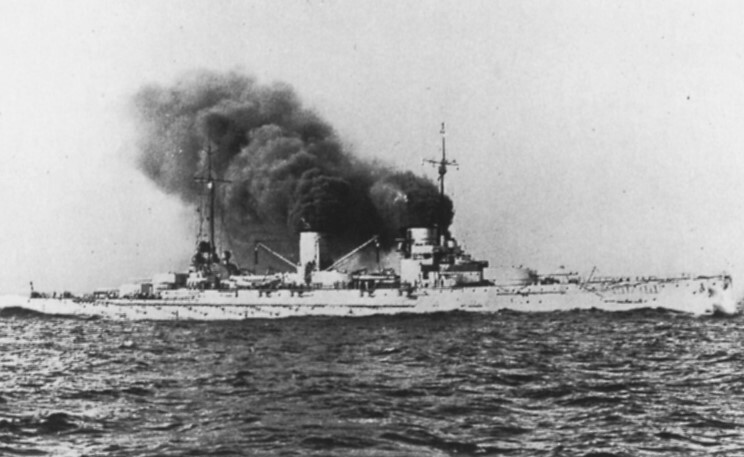 After the two German ships met up, 'Goeben' continued on to the Bosphorus, where she was mined in the afternoon. Badly damaged, flooded and with no local dock large enough to take her, 'Goeben' was repaired with cofferdam-filled concrete, but was not operational until May 1915. Goeben, damaged 10th May 1915, Black Sea off the Turkish coast - by 2-12in shells from Russian battleships. At the start of the Gallipoli landings in late April 1915, the Russian pre-dreadnoughts carried out a series of bombardments of the Bosphorus area. This was repeated on the 9th May. 'Goeben' sortied and at 07.50hrs was in action with three of the Russians, including the 'Evstafi'. She failed to get any hits, received two herself, but was not seriously damaged. The two other Russian pre-dreadnoughts had come up, and the by-now seriously out-gunned 'Goeben' ceased fire at 08.12hrs and escaped with her higher speed. Goeben, damaged 20th January 1918, Aegean Sea, off and within the Dardanelles, Turkey - by 3 British-laid mines, followed by aerial bombs. Sailed from the Bosphorus early on the 19th on a sortie with cruiser 'Breslau' to attack Allied forces off the Dardanelles. Struck one mine early on the 20th on passage out and slightly damaged. Sank British monitors 'Lord Raglan' and 'M.28' in Kusu Bay, Imbros island around 07.40 hrs, but as the two ships rounded Cape Kephalo at 0830 and headed for Mudros, Lemnos island, 'Breslau' hit a mine. 'Goeben' was taking her in tow when mined again, and then the cruiser detonated four more mines in quick succession, settling fast at 0900 with most of her crew. 'Goeben' headed back for the Dardanelles, hitting a third mine, and then half way in and listing, ran hard aground at Nagara Point just before midday, still on the 20th. Attacked by British aircraft, including Sopwith Baby seaplanes from the 'Ark Royal', a reported 270 sorties were made, but the bombs that hit were too small to cause serious damage. The only British submarine 'E-2' was unserviceable at Malta. The 'E-14' (Lt Cdr White), normally on patrol in the Otranto Straits, was despatched from Corfu, broke through to Nagara Point on the 27th, but found 'Goeben' gone, towed off the day before by Turkish pre-dreadnought 'Torgud Reiss'. The British submarine was sunk. With the 'Goeben' largely out of action for the rest of the war, the German Mediterranean Division ceased to exist, but she survived as the Turkish 'Yawuz' until well after the end of World War 2. Hayreddin Barbarossa - Variously 'Heireddin, 'Harradin, 'Kheiredin, 'Hairredin Barbarossa', modern 'Barbaros Hayreddin Pasa' or 'Barbaros Hayrettin'. Ottoman grand admiral (1534-46) born as Hizir Reis on the island of Midilli c 1466. Called Hayreddin by Muslims and Barbarossa - the Red Bearded One by his European enemies. HAYREDDIN BARBAROSSA, 8th August 1915, Turkish Waters, off Bulair, Gallipoli Peninsula in Sea of Marmara (40-27N, 26-48E) - torpedoed once by British submarine 'E-11'. One day after the last Allied landing on the Gallipoli Peninsula - at Suvla Bay - in a final attempt to break the deadlock on land, pre-dreadnought 'Hayreddin Barbarossa' (Commodore Mustafapasali Muzaffer) had sailed through the Sea of Marmara, escorted by two destroyers to support the Turkish land defences. Expecting her to take part in the battle, 'E.11' (Lt-Cdr Naismith VC), on her second patrol in the Sea of Marmara during which she accounted for numerous vessels including torpedo gunboat 'Berc-i-Satvet' that month, waited at the northern end of the Dardanelles Narrows. The 'Barbarossa' capsized and sank in fifteen minutes with the loss of 250 men. Mesudiye - also 'Messudieh' or 'Messudiyeh'. From Arabic word meaning good fortune, auspiciousness, happiness. No longer in general use, but would be spelt 'Mesudiyet'. MESUDIYE, 13th December 1914, Turkish waters, off Chanak in the Dardanelles - torpedoed once by British submarine 'B-11'. 'Mesudiye' (Commander Besiktasli Arif Nebi) was moored as guardship just south of the Dardanelles Narrows at Chanak, in Sari Siglar Bay on the Asian side. Against the strong currents, British submarine 'B-11' (Lt Norman Holbrook) managed to penetrate some 12 miles and negotiated five lines of mines. Sighting her at anchor, 'B.11' fired one torpedo from 6-800 yards. 'Mesudiye' rolled over and sank in 10 minutes, trapping many men inside who were later released. Most of her guns were salvaged for the shore defences. Losses totalled 38, including 10 officers and 27 men. 'B.11' escaped safely back to sea and Lt Holbrook was awarded the Victoria Cross. Medjidiye - or 'Medjidieh'. Means glory or honour, one of the ascriptions of God. Also the name of a coin and a distinction later awarded by Ottoman rulers as the Mecidiye Order. No longer in general use, but spelt 'Mecidiye'. MEDJIDIYE, 3rd April 1915, Black Sea, 15 miles off Odessa, Russian Ukraine (c 46-15N, 30-45E) - by one Russian mine. Sailing to attack Russian transports at Odessa in company with the 'Hamidiye' and four torpedo boats under the overall command of German Cdr Buchsel, 'Medjidiye' went down in shallow water around dawn, just short of the target. One of the torpedo boats attempted to destroy her with a torpedo. A major loss for the small Turkish Navy, most of her crew were rescued by the torpedo boats, but there were 14 men. (Some sources describe her as returning from bombarding Odessa or even the inland port of Nikolayev). 'Medjidiye' was salvaged by the Russians in June 1915 and recommissioned as the 'Prut' in October, named after the minelayer lost to 'Goeben' in October 1914. Captured by the Germans at Sevastopol in 1918 and returned to Turkey, surviving until 1948. Samsun (Lt Cdr Uskudarli Nezir Abdullah) was sunk by British submarine 'E-11' on the 14th August 1915 off Hora (Khora?) in the Sea of Marmara according to Turkish sources. 'Conway's' and 'Janes Fighting Ships' show her as surviving the war with her two remaining sisters. JADHIGAR-I-MILLET (modern form 'Yadigar-i-Millet' - The Nations Reminder), night of 9th/10th July 1917, Turkish waters, off Istinye (the Golden Horn), Constantinople in the Bosphorus (39-56N, 29-10.5E) - bombed by a British RNAS aircraft. A Handley Page bomber flown out from Britain, flew from Mudros late on the 9th to attack the German big ships 'Goeben' and 'Breslau' based at Constantinople. They were missed but the nearby 'Jadhigar-i-Millet' (Lt Cdr Cesmeli Raif Said) was hit and sunk just after midnight on the 10th; there were 29 men. She was refloated and scrapped. Nusret (Lt Cdr Tophaneli Hakki) was one of a number of miscellaneous mine warfare ships. On the night of the 8th March 1915, under the guidance of Lt Col Geehl, a Turkish mine expert, she laid a line of 20 mines in Eren Keui or Arenkioi Bay at the time of the Allied naval attack on the Dardanelles defences. Ten days later on the 18th, British pre-dreadnought battleships 'Irresistible' and 'Ocean' and the French 'Bouvet' were all lost in this small field, and British battlecruiser 'Inflexible' badly damaged. If any one small ship changed the course of World War 1 it must be "Nusret".